Are plans for Crimean oil and gas sale in Russia’s interest? Crimean authorities plan to nationalize gas company Chernomorneftegaz and then sell its assets to Russia. Not only would the sale create risks for Russian state giants Gazprom and Rosneft, but gas deposits could potentially become the subject of a territorial dispute between Crimea and Ukraine. The speaker of the Crimean parliament, Vladimir Konstantinov, has announced plans by the Crimean authorities to fully nationalize the assets of Black Sea gas company Chernomorneftegaz and then sell them to a Russian state company, possibly Gazprom. "These are our deposits and we shall fight for them," he said in a recent interview with news agency RIA Novosti. At the same time, Konstantinov suggested that "oil and gas production should be dealt with by Russia and Gazprom, as it is not our story." The Crimean authorities intend to hand over Chernomornaftogaz to Russia's Gazprom (MOEX: GAZP) whose specialists have effectively taken the company under their control, Chernomornaftogaz Deputy CEO Vladimir Plechun said. Chernomorneftegaz, which is a subsidiary of Naftogaz of Ukraine, brought in revenues of about 5.5 billion rubles ($150 million) in 2012. 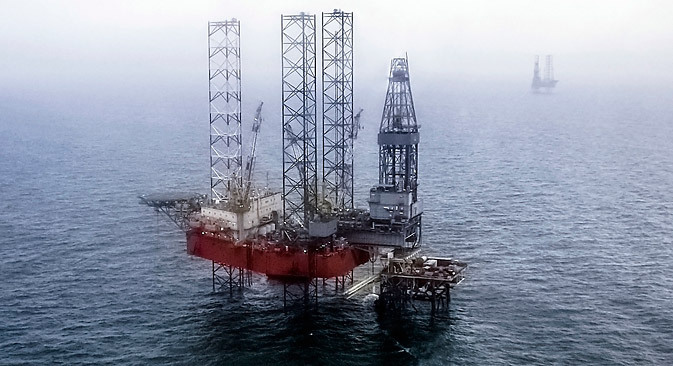 The company owns 17 licenses, with most of its production based offshore, in the northwest of Crimea. Last year production grew by 40 percent, to 1.6 billion cubic meters, accounting for nearly 90 percent of the peninsula's gas requirements. Chernomorneftegaz also owns an underground gas storage facility with a capacity of 1 billion cubic meters, called Glebovskoye, as well as 1,300 km of trunk gas pipelines, a fleet of 29 vessels for servicing gas production rigs and a ship repair facility. Chernomorneftegaz is actively engaged in offshore exploration and intends to increase its production next year to 2.4 billion cubic meters of gas. Its main basis for growth is offshore gas fields in northwest Crimea, in particular Odesskoye and Bezymyannoe (see infographics). However, these fields are geographically located closer to the Ukrainian rather than the Crimean coast, so there is a possibility that Kiev may claim them as its own even if the peninsula ceases to be part of Ukraine. Alexander Bagin, head of research for the natural resources management institute at the Higher School of Economics in Moscow, points out that continental shelf boundaries are defined on the basis of the UN Convention on the Law of the Sea and are set in intergovernmental agreements. Lawyers specializing in maritime law preferred not to comment on the possible ramifications that Crimea's secession may have for the issue of the continental shelf boundaries. Rosneft already owns licenses for oil and gas fields in the eastern part of the Black Sea. All these deposits are being developed, including with the participation of foreign multinationals Chevron, Exxon Mobil, and Total. Financial analyst and head of Miravil GroupNatalya Lebedeva told RBTH that gas produced in the Black Sea is most likely to be supplied to Eastern Europe via the South Stream pipeline. It may also go to Turkey via the Blue Stream pipeline. As for whether Russia needs Chernomorneftegaz or not, Lebedeva said it was more of a political issue than a matter of economic gain. Based on material published by Kommersant and RBTH. Click here to enlarge the infographics.